May the Baking Force be with you. Hey all, this is Sue from Cake balls, cookies and more. I am here today to share some information with you about cake balls and pops. Mary emailed me a while ago asking for some suggestions in making some for her friend. And I love to talk about treats so I was more than happy to chat about it. Mary Ellen asked me if I would be willing to share some information with you all about how I make cake balls, and I said sure, I have some to make so I can do that. So today I want to share with you some of the basics I use and maybe some tricks. 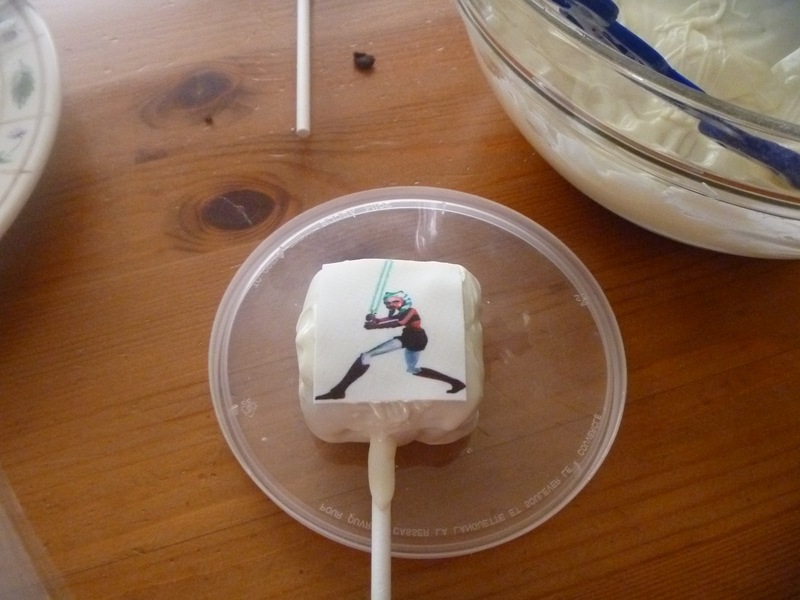 I also want to share with you the Star Wars cake pops I made for a friend this week. 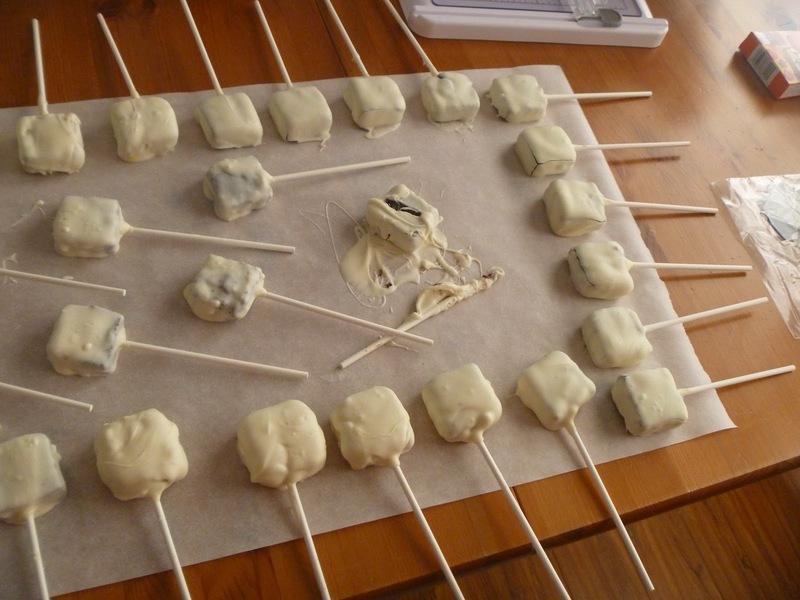 Firstly I found out about cake balls and pops like most people, through the Internet. 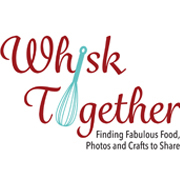 I had heard about them then saw them on a blog called Bakerella. She had lots of great advice and I started there then made my own steps that work for me. I had Hubby make my cake because I was working. So I always start the same way, with a cake and a plan. I use a box mix and canned frosting usually. My reasoning is that it is easiest and most cost effective. And I figure I am crumbling it all up so you know, why not. But you feel free to use whatever kind of cake and frosting you like. For this I am using a chocolate cake and frosting. I also usually do my cake balls over a few days. I do this because I am usually making a large amount and I never have a day just for baking. I work too much don’t you know; well at least that is what I tell hubby. My baking goes like this. Makes it so easy for me to do a little each day, but you will figure out what works for you. 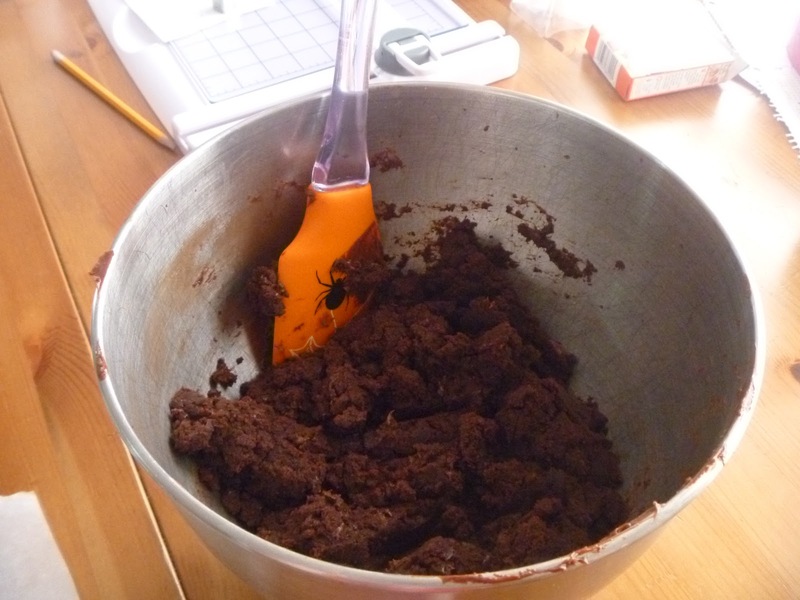 Here is the mix, see how it is like a dough now, that is because I was careful not to add too much icing. 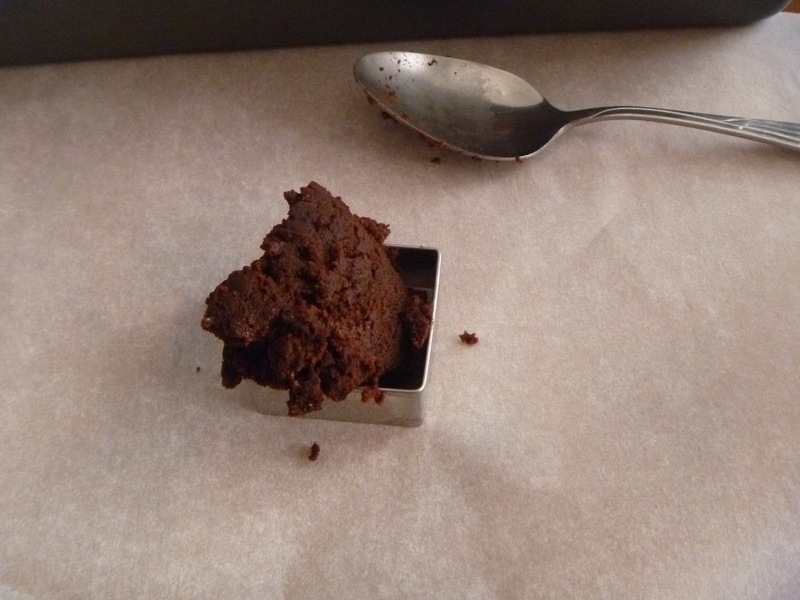 So to start bake your cake and let it cool completely, if you are in a rush just pop the pan in the fridge or freezer. Once cooled you crumble it up. Bakerella does it by hand from what I can tell, but I am lazy. So I crumble it up into my kitchen aid then with the flat paddle just finish crumbling it up. Then I add frosting by the spoon full until it all comes together. 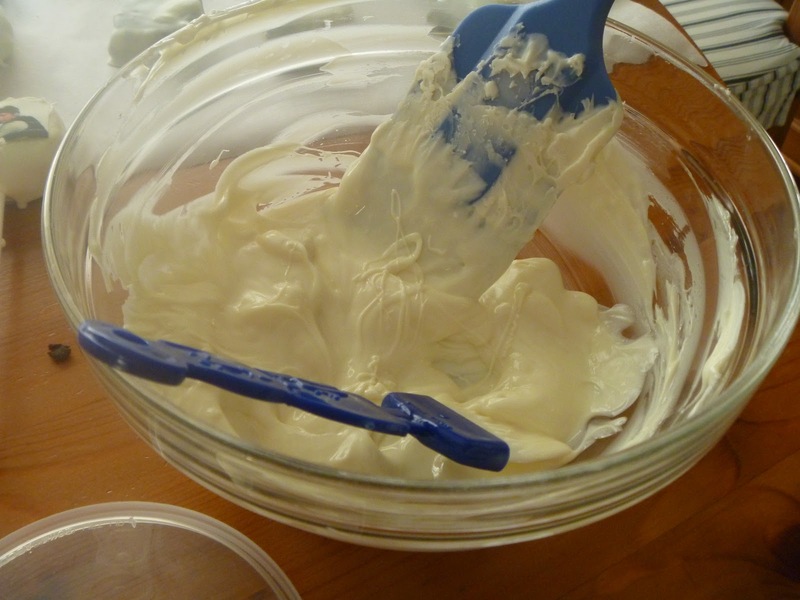 If you add too much you risk the mix being too soft, and this will cause problems when you try to shape and dip the balls later. 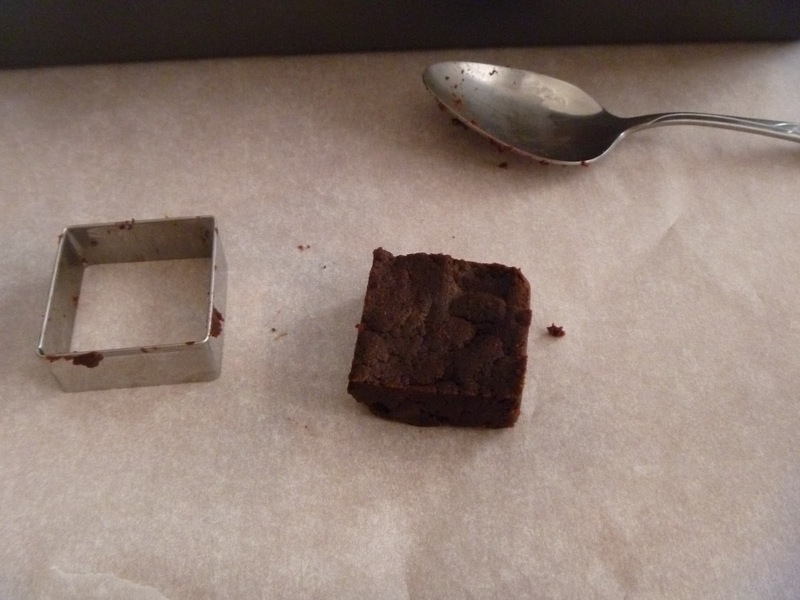 I used a spoon for the first one so my hands would be clean enough to use the camera. For the rest I just used my hand to scoop out some dough into the fondant cutter I used. Once you have your mix ready you can shape it however you like. Traditionally you want a ball of some sort. I use all different sizes of ice cream scoops, from my tiny itty bitty TSP one, to my large 2 TBSP one. Just depends on what you want to make. 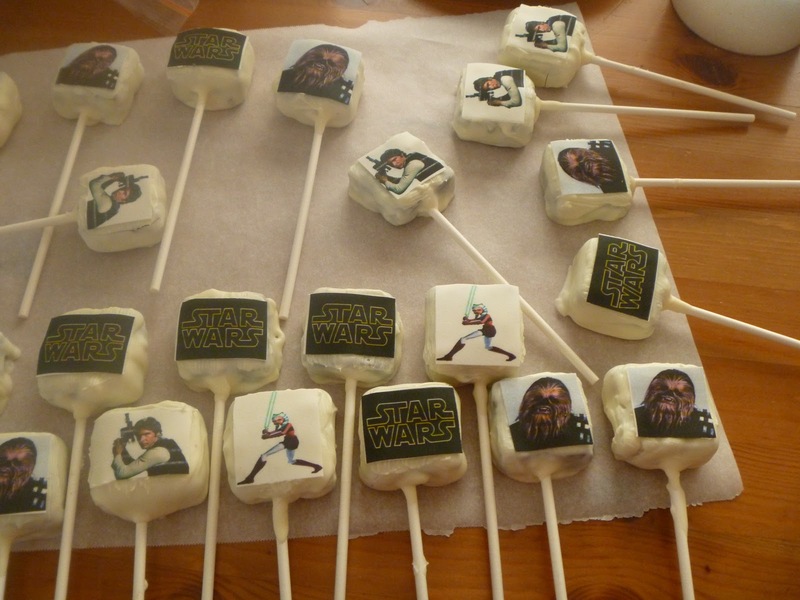 For the Star Wars cake pops I actually used another technique. I am sure I am not the first to do this, but I figured it out by myself and thought I was smart. Feel free to think I am smart too if you like. Make sure you press it down to make it full and as even as possible. Then just push the shape out, it should not be too hard to push it out. So I always work on wax or parchment paper. I put the cookie cutter I want to use down then fill it with cake ball mix. I press it down to make it flat then lift the cutter up. Then I put the shape on a flat pan or cookie sheet covered in wax paper and put it in the fridge for a few hours or the freezer for about 20 minutes. This is how I put them in the freezer. If they are going to be in there any longer than an hour I wrap the pan in plastic wrap to stop them from drying out. While the cake balls are cooling get your stuff together. You will need something to dip your cake balls in and then whatever else you want to decorate them with. When I do just normal cake balls, I use my favorite chocolate candy melts and either sprinkles or a different color chocolate to drizzle over them. For these Star wars ones, it will be different but the same. I set up my dipping station, lots of wax paper gets used in my house. When dipping a cake ball, I use the candy dipping tools I got at Micheal’s, you can use a fork or spoon or whatever feels right. Also only take a few cake balls out of the fridge at a time so they do not get too soft. 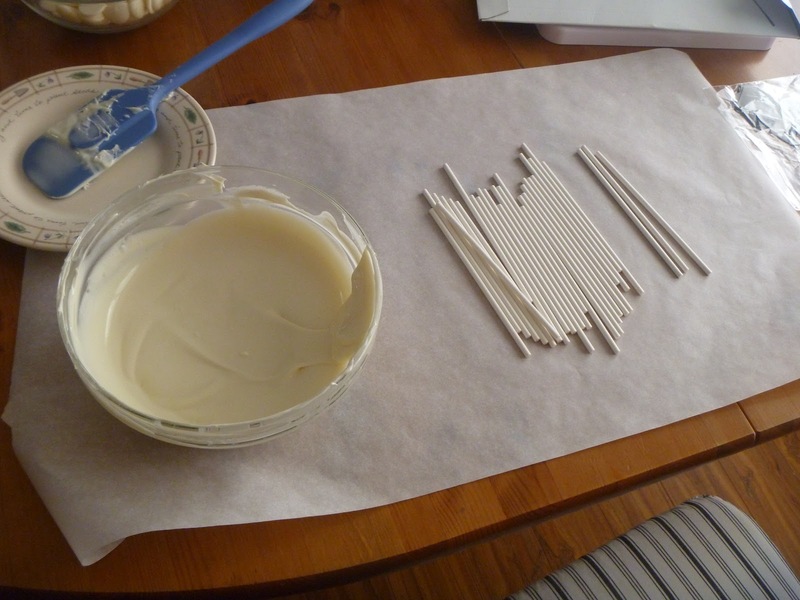 Then dip your cake ball, tap off the extra chocolate and put it on a sheet of wax or parchment paper to dry. Then decorate, if you are using sprinkles I suggest putting them on as you dip the cake balls. 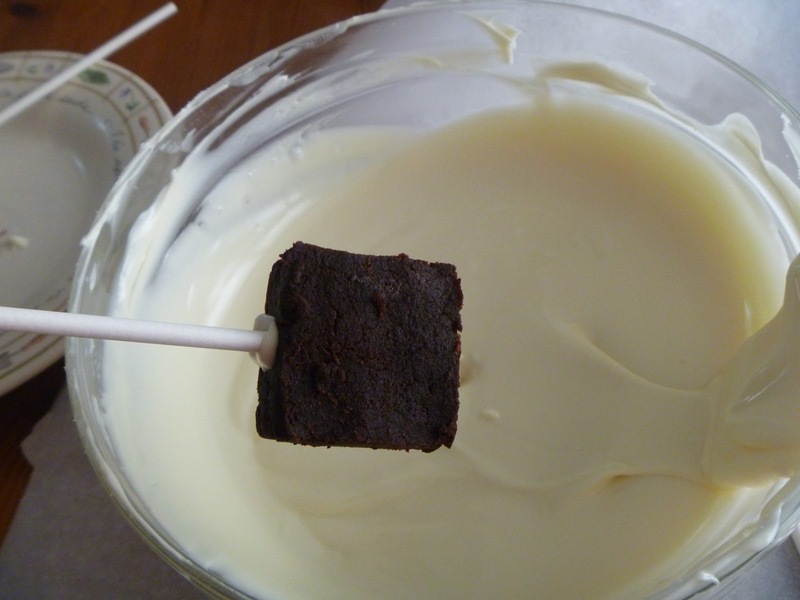 Always dip the stick in melted chocolate that gives it something to stick to the cake pop filling. If you are doing pops you can do this a few ways. 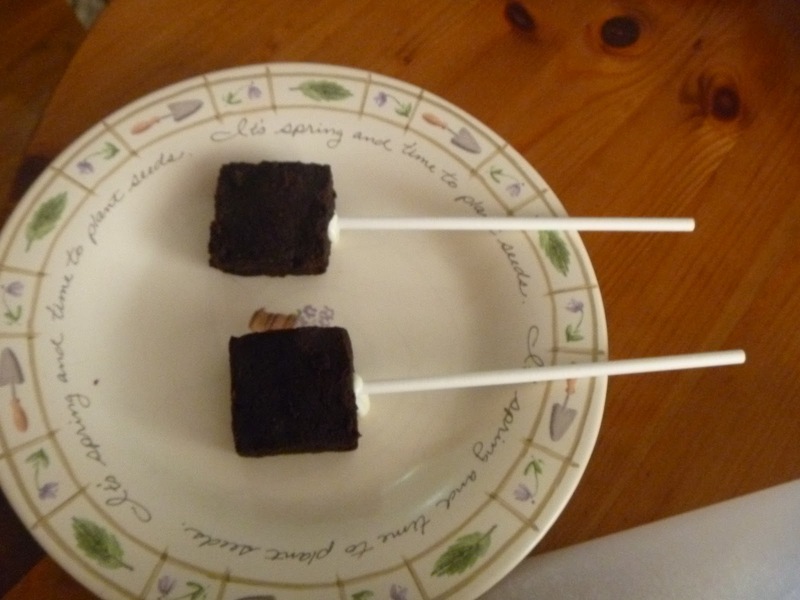 To have self standing pops, dip the stick you are using in the melts, then put it into the cake ball, dip the ball and set it on the wax paper to dry with the stick facing up. If you are doing traditional pops, instead of standing the ball up, stand it up with the stick in Styrofoam or a block of some sort. 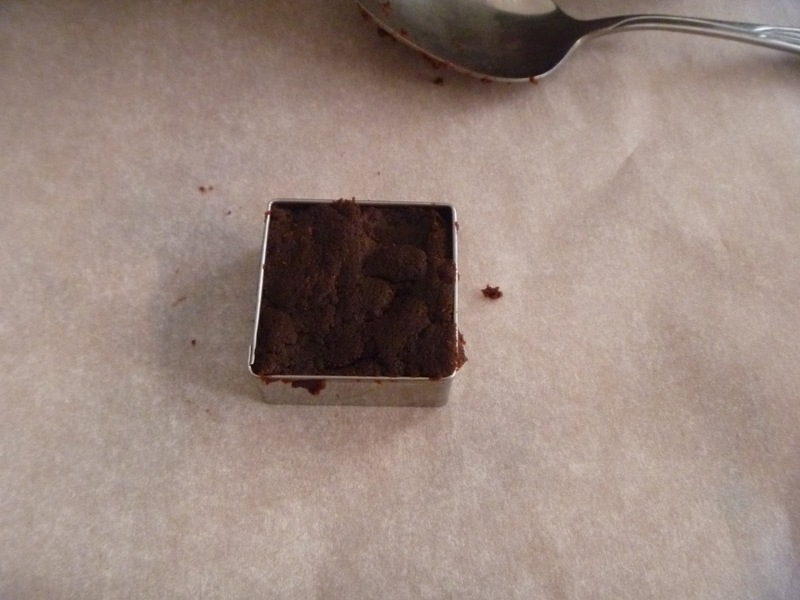 When you dip, try not to move the pop around too much or bits of it break off making the chocolate all chunky. 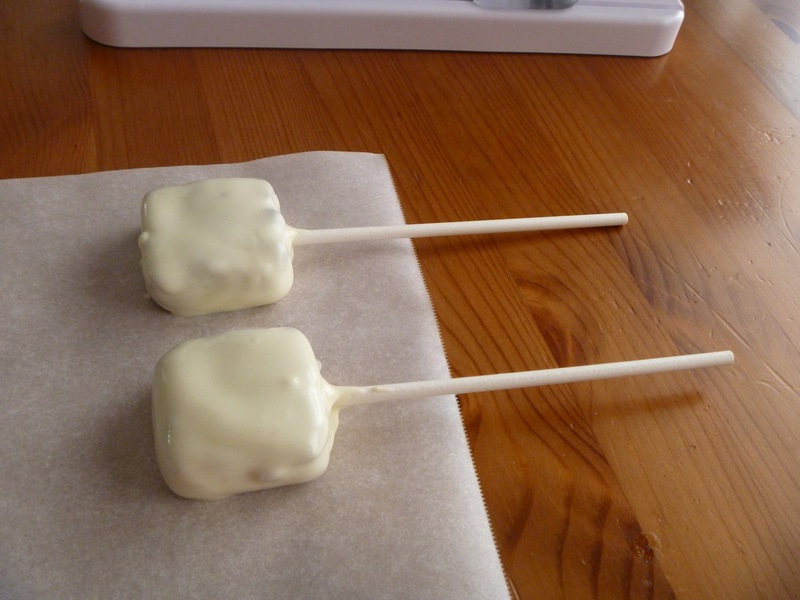 For these flat shape pops I just dip the cake pop on the stick, drag some of the chocolate off the back and then just lay it on the wax paper to harden. I usually leave then for at least 30 minutes, this allows them to come back up to room temperature. And as they do they may crack. I am not sure if it is because of the chocolate being hot, or the middles being too cold, or what. I just know that I end up double dipping mine to cover the cracks, it’s easier than trying to figure out why I cannot get a good crack free coating in one go. And that is how they look once dipped. So once they are all dipped I let them dry, if you are doing regular cake balls, you don’t need to double dip really. I will used another colour of chocolate and drizzle it over to hide the cracks. And with regular round cake pops, same thing as these I double dip usually. 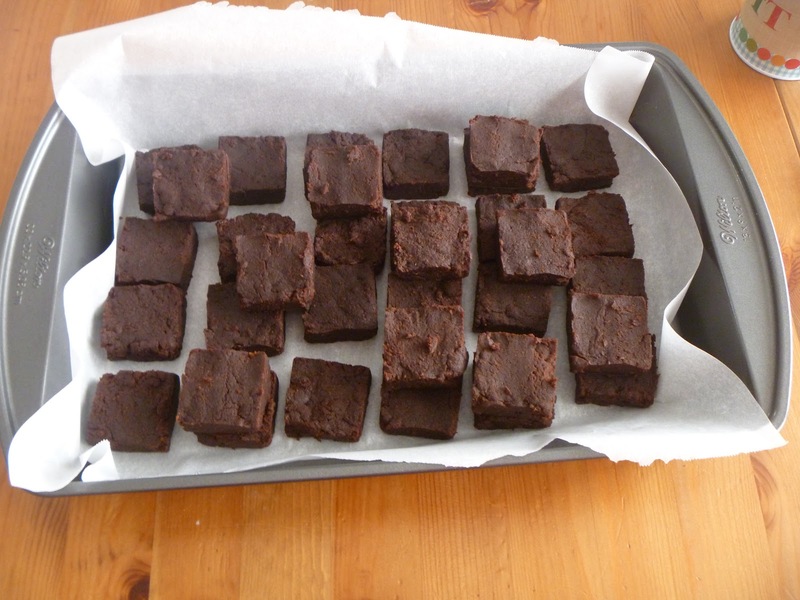 And this is how they look as they are drying, some of them are cracking, as as you can see one fell off it’s stick. I always make extra for this very reason. 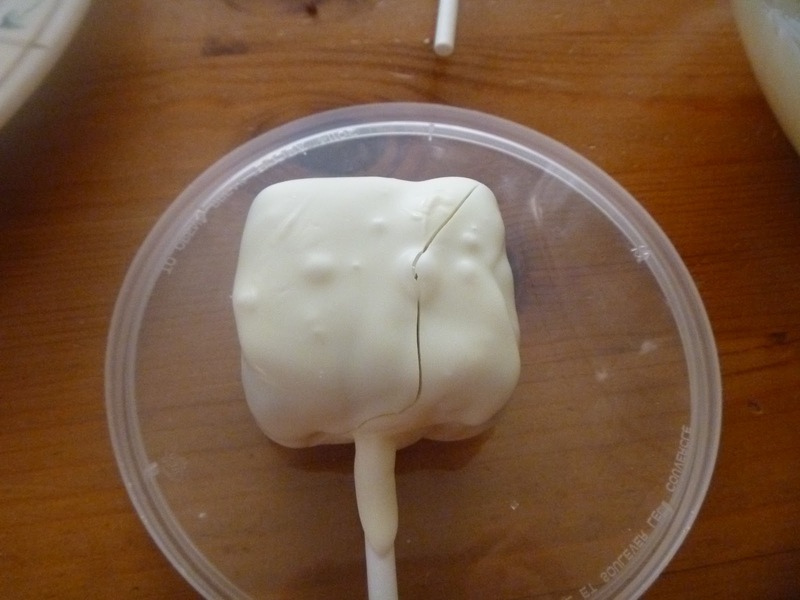 See the crack, you are going to cover it in chocolate then the image. While the cake pops are drying I get my decorations all set up. Depending on what you plan to do you get it all set. 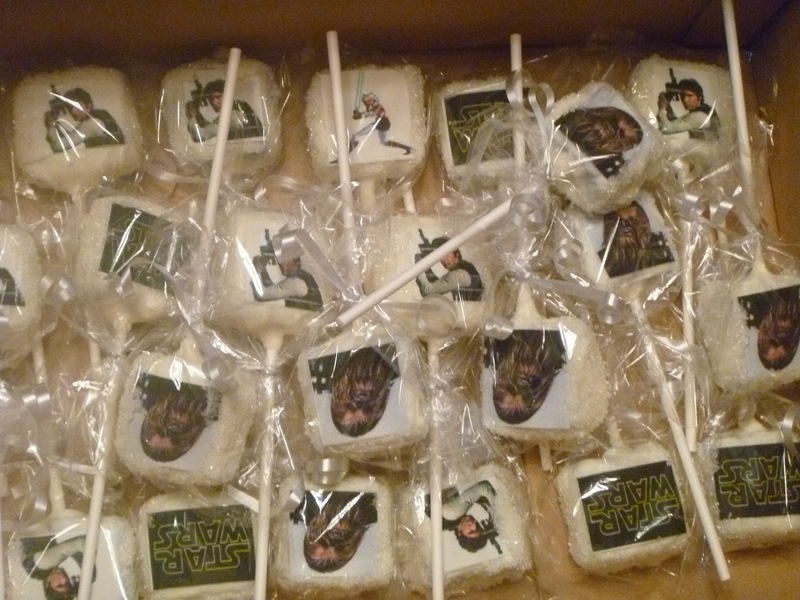 This was my first time making cake pops with pictures on them. As I was going to cover them I did not need to double dip to cover the cracks. So I started by getting Hubby to put some pictures together for me. Since our computer at home is broken he just got them printed out on regular paper. Then we scanned them on my edible printer and printed them out. If I was smart I would have cut them out and put them all on one page to save the icing paper. But I am not smart and do not think of these things until after the fact. This is the icing sheet, you can see part of the fondant cutter. It is just like a paper cutter, just cooler. To start I cut out my pictures, I have a fondant cutter from Wilton, I never used it before, but it worked great. You just have to push on the blade a bit, but it was much faster than trying to cut it all out with scissors. Then I put them in a baggy so they would not dry out. The paper dries out so fast! I keep them in a baggy so they don’t dry out. As this was my first time doing this I was not sure if I should use melted chocolate or maybe corn syrup to attach the image. I tried the melted chocolate and it worked great. It also made it easy to fill in all the cracks with chocolate. So I just used a pastry brush and brushed on the chocolate then stuck on the image. You need to make sure your hands are clean and dry, as you need to press the image out to make it stick and wet hands will tear the paper. I used the left over chocolate to brush on and stick the pictures to. So once the images were all on, I went back and painted the rest of the pop and dipped it in white decorating sugar. This allowed me to cover all the rest of the cracks and sparkle up the pops. Don’t worry too much about the edged, they will be covered in sugar later. It is hard to see but there is coarse white sugar all over the sides and back of the pops. When I was all done I put them in little sucker bags and tied them with ribbon. I also curled the ribbon. Something I never do when just giving my treats to friends. This was for a party so that is why I got all fancy don’t you know. And here they are all wrapped up and ready to go. I do not put them in the fridge as they will get condensation on them and make the pictures bleed. So have fun, and remember there are so many ideas on line, just google for what you want and chances are you will find something. And if you want to do images but not buy a printer you can usually get them at your local bakery by the sheet. I think my printer has been one of the funnest things ever. Also my kid loves to eat the paper I don’t use, so you know there is that too.